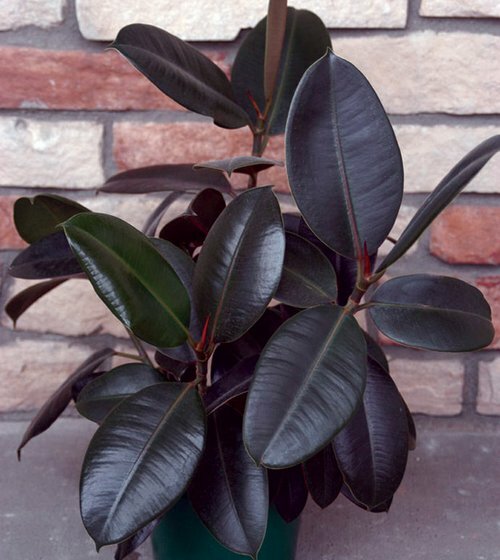 Ficus is a genus in the Moraceae family. The genus contain around 800 species; from vines and shrubs to woody trees. A majority of the ficus species originates from the tropical regions, but some also grow wild in subtropical and temperate zones. There are three types of ficus – tree types, bushy type (slow-growing F. diversifolia) and trailing types (F. pumila or Creeping Fig which produces a dense green carpet). 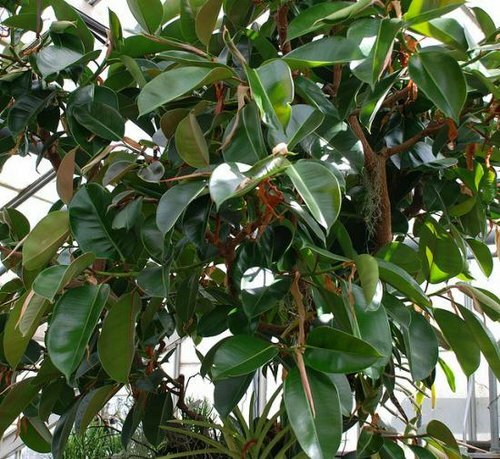 In this article we’ll write more about tree types of ficus plants. In the Ficus or Ornamental Fig family are found house plants which vary from stately trees to lowly creepers, and since Victorian times the unchallenged head of the family has been the Rubber Plant. Once only the narrow-leaved F. elastica was grown, but this old-fashioned variety has now been replaced by the much more attractive F. elastica decora and F. elastica robusta. 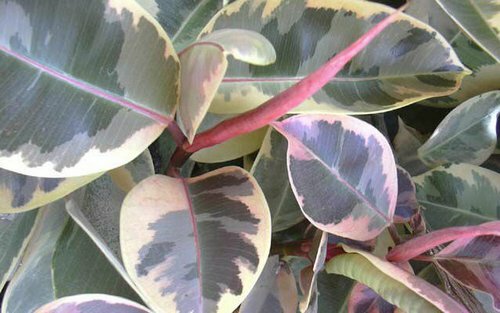 The all-green Rubber Plant are much easier to grow than the variegated ones, and by far the most important danger is overwatering. Wash leaves occasionally. 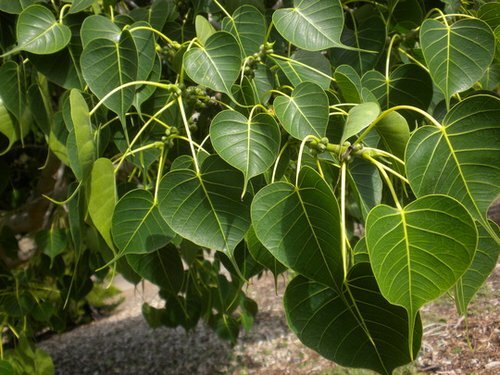 One of the most well known ficus species is the Ficus carica, a plant known as the Common Ficus. This ficus produce a fruit called a fig that is an appreciated fruit in many parts of the world. The Ficus carica is therefore commercially grown and the figs harvested and exported. Many other ficus species will also produce edible fruits, but they are less popular and rarely grown commercially. The fruits of the fig trees develop from a specially adapted flower. The fig fruits are so called accessory fruits; syconiums. The fruit is globular and has a small opening located in one end. This opening is named ostiole. Inside the fruit your will find a hollow area that is outlined by small edible seeds. The colour of the seeds is red. Ficus plants come in two sexes: female plants and hermaphrodite plants. They relay on wasps to pollinate them, and the small ostiole is an opening developed especially for the wasp to crawl through. The hermaphrodite plants are sometimes called caprifigs, since they are less tasty and “only goats will eat them”. It is inside these caprifigs that the pollinating wasps grow up, sheltered by the fruit. 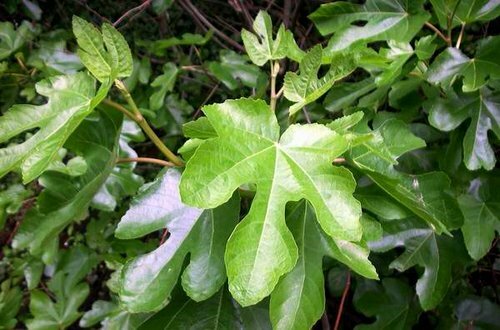 Another popular ficus species is the Sacred Fig, Ficus religiosa. The Sacred Fig is found in many parts of the world and it therefore known by many names. In regions were Sinhalese is spoken, the tree is named Bo. In other regions, commonly used names are Pipal, Peepul and Ashwattha. The Ficus religiosa originates from the region from India to southwest China, and from Indochina to Vietnam. The Sacred Fig grows very large; up to 30 meters. The trunk can reach a size of 3 meters in diameter. 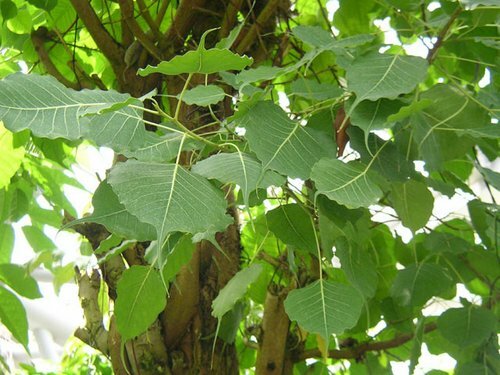 It is a semi-evergreen or dry season deciduous species. The Sacred Fig is considered sacred in many parts of Asia since it is hallowed by followers of the Buddhist, Hindu and Jainism religions. Some Muslims will also consider certain Ficus trees sacred. According to legend, Siddhartha Gautama sat under a Sacred Fig when he became enlightened and turned into Buddha. Ascetics and yoga practitioners still like to meditate under Sacred Figs. Two of the most famous Sacred Figs are the Bodhi tree and the Sri Maha Bodhi. 1. The Bodhi tree is probably a clone descendant of the tree under which Siddhartha Gautama is believed to have received enlightenment. It is growing at the Mahabodhi Temple in the state of Bihar in India. Today, it is a very large and ancient tree. Pilgrims flock around the Bodhi tree and it is one of the most important holy sites for Buddhists. 2. Sri Maha Bodhi is another famous Sacred Fig. Just like the Bodhi tree in India, this tree is believed to originate from the Sacred Fig under which Siddhartha Gautama sat. Sri Maha Bodhi grows in Anuradhapura in Sri Lanka and was planted there in 288 B.C. This makes it one of the oldest living trees that we know have been planted by humans, and also one of the oldest with a known planting date. Light: Bright spot for tree types, partially shaded site for others. A Rubber Plant will adapt to a few hours’ sunshine each morning, but this would be fatal to a Creeping Fig (trailing type of ficus with smaller leaves). Water: Water with care. With tree types the compost must dry out to some extent between waterings. Air Humidity: Mist leaves occasionally in summer. 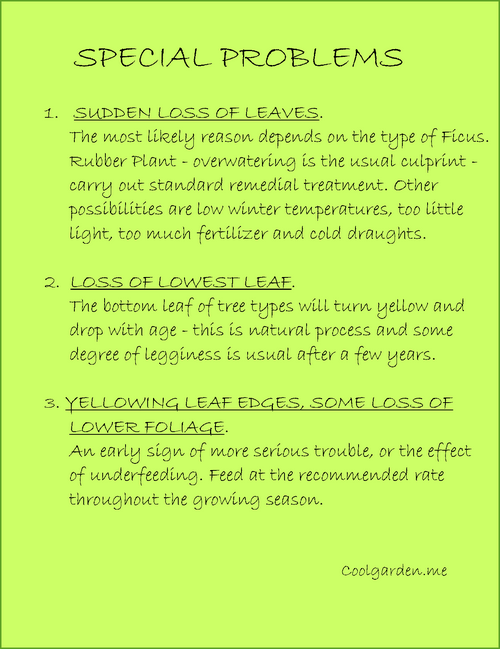 Repotting: Avoid frequent repotting. Repot in spring every 2 years until the plant is too large to handle.